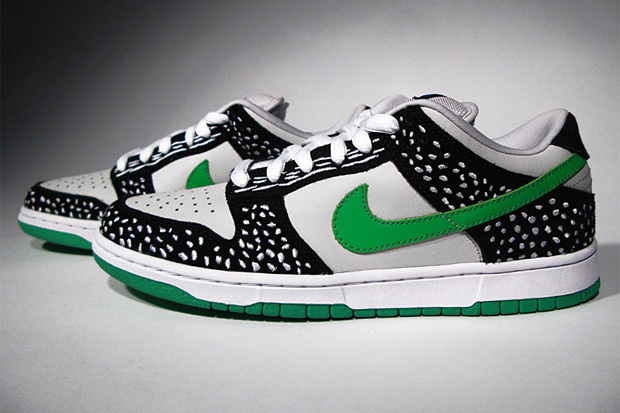 It looks like those hyped Nike SB Dunk Low “Loons” samples from some years back have finally hit production as we get some news of an official release for Holiday 2010. Familia Skateshop in Minneapolis, Minnesota will be among the first to stock the kicks, originally designed by Nike SB Midwest regional rep Rob Sissi. The overall aesthetic takes cues from the Minnesota state bird with a grey/black/white upper featuring vibrant hints of green and blue. A release is set for November 6th, 2010 through Family Skateshop.